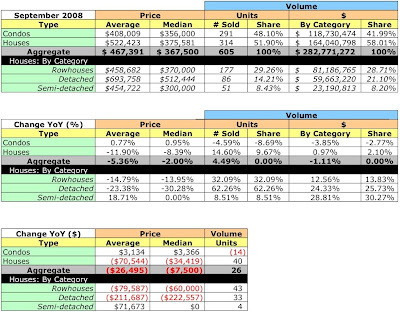 Compared to September 2007, sales volume was up 4.49% and dollar volume was 1.11% lower. In contrast to the prior year, more homes than condos sold in September, 314 versus 291. Old City II led the District in sales, accounting for 17.52% of units sold and 16.73% of dollar volume, far higher than any other neighborhood in the District. Condos dominated sales in Wards 1, 2, and 6. Thirty five homes sold for $1MM or greater; 5.79% of units sold accounted for 19.71% of the month's dollar volume. 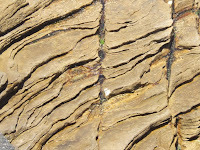 All data have been uploaded for viewing on DCHomePrices.com and DCCondoPrices.com. 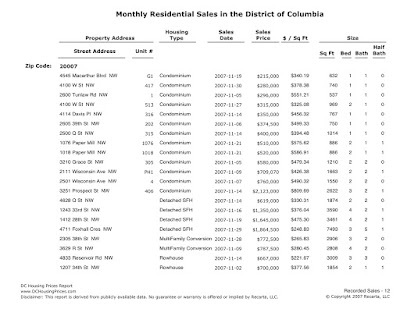 In September 2008 the District recorded 605 residential sales. 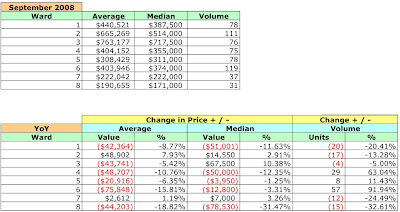 The average sales price fell 5.36% and the median sales price fell 2%. The condo market continues to retrench: unit sales are down 4.59% YoY and dollar volume is down 3.85%. The number of homes sold rose a healthy 14.6%, but dollar volume was flat, ticking up 0.97%. Wards 1-3 and 7-8 had lower unit sales YoY. 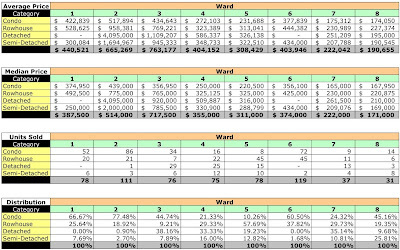 Wards 2 and 7 experienced increases in average sales price; Wards 2, 3, and 7 had higher median prices. 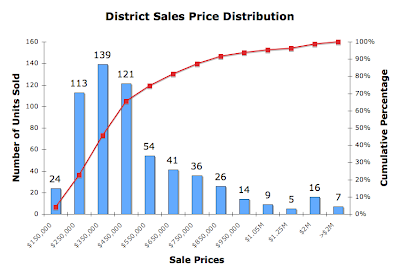 Ward 8 had the steepest drop in sales volume, dropping almost 33%. Condo sales ruled Ward 2 [again]: 77.48%. The chart below shows the distribution of September's recorded sales by sales price. YoY, single family home unit sales were up a robust 14.6% in September. However, the average sales price dropped 11.9% and the median sales price fell 8.39%. Despite huge gains in unit sales, average and median sales prices for rowhouses and detached homes dropped significantly: rowhouses, down 14.79% and 13.95%; detached homes, down 23.38% and 30.28%. Note: Data may not be available for all properties. My analysis is dependent upon the completeness and fidelity of the District's appraisal data. 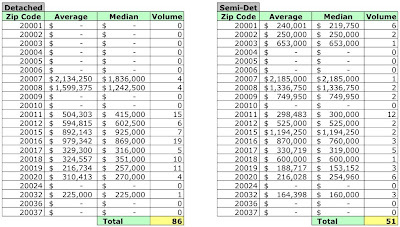 September 2008 average and median sales prices and unit volume by zip code. 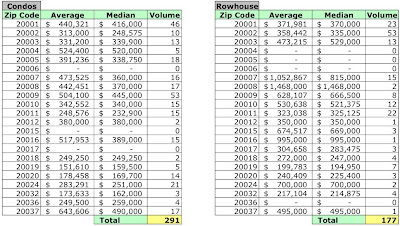 September 2008 average and median sales prices and unit volume by neighborhood. Why aren't condo prices down more, or why are condo prices down less than rowhouses and houses? I don't get it . . . really should be the other way around. Are higher-end condo's coming on the market, or are the price declines masked by incentives? I've not done the analysis, but I assume the new properties coming online boosted average and median sales prices for condos since their prices - the new properties - tend to be even stickier than those of resale properties. In that case, MRIS' data is probably a better gauge of market conditions.